Blount, Jane, 1990, [reviews] Human Body, Reference Reviews, 5 (2): 41. Richards, Roy, 1991, review of The Human Body, Primary Science Review, 18: 31, June. News Report, 1991, [review of The Human Body, Belitha], Peterborough, Evening Telegraph: 15, 24 January. 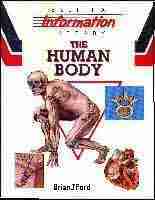 Huth, E. J., 1991, review of Our Bodies, based on BJF, The Human Body, Belitha Press, q.v., Science Books and Films, 27: 52, March. Skotnicki, P. A., 1991, review of Our Bodies, based on BJF, The Human Body, Belitha Press, q.v., Appraisal of Science Books for Children, 24: 86, Summer. Troyer, K., 1991, review of Our Bodies, based on BJF, The Human Body, Belitha Press, q.v., Appraisal of Science Books for Children, 24: 88, Summer. or move to the BODY BOOK web site.